This review is of the cut shown at the BFI London Film Festival in October 2015 – the UK release date is currently listed for January 15th 2016. For anyone who hasn’t yet had the opportunity to read Emma Donoghue’s bestselling novel Room, on which this film is based, we highly recommend doing so. It’s a fascinating, quick read (or at least it was for this reviewer; they finished it in two days straight) that presents a truly unique perspective to an otherwise unimaginable crime, and is an emotional journey that will stay with you long after you finish the last page. For the film, Donoghue adapts her own novel into a script that is just as punchy and gripping as her written prose, but as strong as her script is there are a few more faces that also deserve credit for not only portraying her story so expertly on the big screen but also making it as touching and heart-pounding as it originally was. Those names include, but are certainly not limited to, director Lenny Abrahamson and lead actors Brie Larson and Jacob Tremblay. Abrahamson, whose previous film Frank was one of our favourites of last year, directs the story of young Jack (Tremblay), a five-year-old boy who has lived in a tiny confined room with his Ma (Larson) all his life, with only who he knows as Old Nick (Sean Bridgers) coming in at regular intervals. Much like Donoghue’s book, the first half of the film takes place solely in “Room”, as Jack likes to call it, and we are right there in the cramped dungeon along with Ma and Jack the whole time, not even stepping outside until a certain point. Carrying the bulk of this first half, aside from Abrahamson’s stern and claustrophobic direction, is the undeniable connection between the two actors; Larson, criminally overlooked a couple of years ago for Short Term 12, shines brightly as both harrowed victim and loving mother, while Tremblay – seven at the time of shooting, playing a five-year-old – is an impressive young find who is bound to go onto great things, and their strong bond is what gets us through some of the much darker elements of this first half. The whole first half is a great sequence of confined storytelling, but their strong determination and believability is what makes it truly outstanding. Thankfully, the high levels of drama continue when, much like the turning point in Donoghue’s book, we finally venture outside and watch both characters struggle to adjust. This is also where the more notable changes in adaptation can be spotted; the book’s lengthy stay in hospital is reduced drastically in the film, with the action being moved to the home of Ma’s mother (a strong Joan Allen) instead; certain characters and scenes from the book are erased entirely, with the film keeping focus on the more important elements. None of them damage the adaptation in any way, since the order of events are still pretty much the same but just in different locations and circumstances. Much like the first half, Abrahamson is able to fully express the emotions of the characters through unorthodox camera angles that can make the most normal of things look alien (fruit and pancakes especially gets this treatment), and even voiceover by Tremblay which may seem like a gimmick but is more used to just give us an idea of the character’s thoughts instead of simple exposition like a lot of bad voiceovers do. It continues to be very well-acted by Larson and Tremblay, with Allen also being a standout with a character that’s more fleshed out in the film as in the book. By all accounts, is Room a good movie? Absolutely. Is it a good adaptation? Certainly. Is it better than the source material itself? Well, that’s more debatable – like most adaptations, certain elements need to be changed or altered, or even removed altogether, to fit a more visual frame of storytelling, and as we’ve discussed there’s quite a few elements in the film where exactly that has happened. The book, of course, is allowed to go into far more detail about the characters’ thoughts and emotions, whereas in film it has to be implied through the acting or direction; same thing about the events that happen throughout the story, such as the tiniest details in a relatively minor moment that must be detailed in the book so that the reader can imagine what they might look like, while a film has to imagine it for you. We heavily suggest both reading the book AND watching the film, so that you can gather as much information on the story as Donoghue allows in her prose and then see the filmed interpretation of it on screen. Don’t worry, the film’s not out nationwide until January, so you have a good few months to buy a paperback or on your Kindle etc to catch up on some truly astonishing writing by a very talented author. 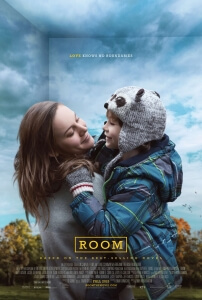 Anyone who has already been fortunate to read it, then we can happily say that the adaptation of Room is a highly successful one, thanks to Abrahamson’s strong direction and extremely engaging performances by its two lead actors working wonders to bring Donoghue’s story to life in more ways than perhaps she herself couldn’t have imagined. Room is an excellent adaptation of an excellent book by Emma Donoghue (who adapts her own work into a strong script) and is bolstered by Lenny Abrahamson’s fantastic direction and two captivating lead performances by Brie Larson and Jacob Tremblay. We highly recommend reading the book before seeing it, however, so you can gather as much detail about the story and characters as possible, and also because it’s a damn good book. Get to your Kindles, now!